From the 25th till the 27th of February the photography hackathon was held in Leuven, Belgium. The main goal of the hackathon was to hack the massive photographic heritage content on Europeana, E-Space and other public repositories to mash them up with user-generated smartphone photos and stories, creating a new environment to experience our cultural past, using apps, websites and virtual environments. People attending were students, developers, cultural heritage professionals, photography people, and technical developers. The Hackathon was organised under the umbrella of the Europeana Space project. The aim of the Europeana Space project is to create new opportunities for employment and economic growth within the creative industries sector based on Europe’s rich digital cultural resources. It will provides an open environment for the development of applications and services based on digital cultural content. The use of this environment is fostered by a vigorous, wide-ranging and sustainable programme of promotion, dissemination and replication of the Best Practices developed within the project. 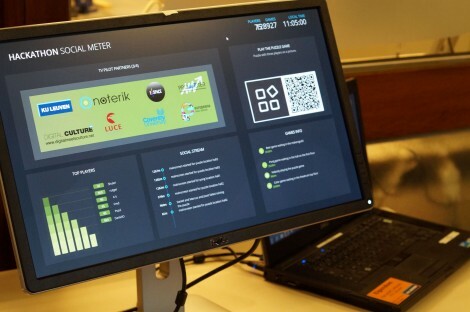 The hackathon was held in the FabLab of the University of Leuven. On day one, seven teams were formed each around a specific topic and the concepts were developed in the course of the following two days. Each team presented their work in two pitches, a trial one on day two and a final one on the third day, with three winning teams selected by an expert jury. The concepts presented included multi-screen technology, GPS located tours, “artified” photographs, photo quest to explore cities, intelligent images, billboard photo exhibitions, VR photo tours, education, GLAM and entertainment. Noterik proudly contributed to two of the teams. The first team focused on education and was dedicated to bring classroom functionalities into the Noterik Qandr application with photography as a topic. Qandr is the ideal tool for audience engagement. Members of audiences can use their mobile phones to answer questions, type words that form a word cloud and use spatial spotting to point something out on the main screen. With the newly build application in Qandr members of the audience can now also use their mobile phones to zoom into a picture on the main screen and move it around. The educational application we developed used these features to allow teachers and students in a classroom setting to explore “the rule of thirds” in photography: By positioning (moving and zooming) a picture or a set of pictures on a main screen as well as on student’s own mobile devices this rule of positioning can be explained and explored in an interactive and engaging manner. The second team Noterik was part of included a delegate from World Press Photo and focussed on bringing the World Press Photo collection, as well as other cultural heritage collections, such as Europeana or Luce, outside of the normal exhibition environment onto large public screens (billboards). Bypassers in public areas can use their mobile devices to scrub through the collection and choose the pictures they want up on the main screen. Crowds can then also log on to the application and listen to the story behind a certain picture on their mobile phones. The photo and audio selected could then be taken home as well. A further interesting element was added by making billboards part of a larger campaign of billboards across a town, all part of the same collection and adding gamification elements linking the billboards. Again the hackathon was a huge success with many great ideas that could lead to valuable applications in the future. Noterik was pleased to have taken part in the event and we are also proud that the teams we joined were among the prize winners.